Last year more than four million people passed through Peterborough station. By 2034, that figure will double to over eight million. 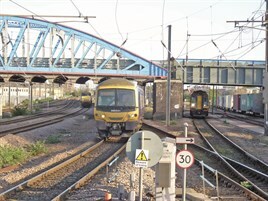 Peterborough is an important interchange on the East Coast Main Line, but it is a bottleneck - five passenger operators run express, inter-regional and local trains through the station, which also has to accommodate more and more freight trains. The station itself was last rebuilt in the 1970s, and a decade ago it needed rebuilding again. Something had to be done to ensure that Peterborough has rail facilities befitting a city whose population has increased by 16.6% since the 2001 Census. That long-overdue upgrade is finally underway - with Network Rail’s £43 million project to remodel the station with new tracks and platforms. However, plans for a station upgrade have actually been on the back burner until very recently, amounting to years of delays. In 2004, in a House of Commons speech, former Transport Secretary and ex-Peterborough MP Sir Brian Mawhinney accused the then Labour Government and the Strategic Rail Authority of breaking promises regarding the new station. GNER, the ECML franchisee at that time, began to invest in the station by providing a new ticket office and waiting lounges. But GNER was growing short of cash, and acknowledged that any major redevelopment would be the responsibility of a new franchisee (RAIL 625). National Express came and went, after defaulting on the franchise, and it was left to the East Coast franchise (operated by the Government’s own Directly Operated Railways) to provide some sort of stability, ensuring that further refurbishment and remodelling could take place in the ticket hall area. That work, funded by the operator and Network Rail, cost £3m and has already led to a brighter, bigger entrance and a larger concourse. Improved departures information has been provided, a gateline has been installed in common with many other ECML stations, and the two retail outlets have been shifted back to create more circulation space, replacing a layout that City MP Stewart Jackson claimed was “25 years out of date”. The refurbished ticket hall and concourse area opened in June this year, while additional improvements to the short stay car park and taxi rank arrangements mean that NR can now focus on the rest of the station. Five operators currently jostle for position at Peterborough - East Coast, First Capital Connect, Greater Anglia, East Midlands Trains and CrossCountry, with each staking their claim for rationed platform space. Long-distance EC services to London use Platforms 2 and 3, as do most FCC commuter services. But conflicts arise on the western side of the station (the current Platforms 4 and 5), where local and regional services operated by East Midlands Trains, Greater Anglia and CrossCountry share space with East Coast services to the North and to Scotland, the latter of which take priority. These competing demands mean there is little room for flexibility. Only the short bay Platform 1 (on the east side of the station) has capacity, as it is only able to accommodate four-car FCC trains, although it is seldom used during the day. NR is more than aware of Peterborough’s importance, although the Peterborough project is just “part of the programme of ECML projects that will allow an increase in services”. For example, southbound towards London, building work on the Hitchin flyover is progressing well (RAIL 700). And just south of Peterborough, plans are afoot as part of Control Period 5 to enhance capacity between Fletton and Huntingdon by installing a fourth track. North of Peterborough, at Werrington Junction, a grade-separated junction is planned to provide access to the Great Eastern/Great Northern ‘Joint’ line (RAIL 699). For the immediate benefit of passengers, however, Peterborough station improvements will be more visible. “We are making a significant investment to improve the railway in Peterborough, providing a better station and more trains for passengers,” says Phil Verster, NR route managing director for London North Eastern. “Rail is vital for Peterborough, given its position as a strategic transport hub, and this upgrade will provide a real boost to the local economy. NR believes that the reconfiguring of the station and the additional platforms will unlock the potential of Peterborough station as a key stop on the ECML and as a regional interchange. Spokesman Sam Kelly says the scheme “reduces a constraint in developing East Coast Main Line timetables, thereby allowing an increase in long-distance high speed and freight services paths”. In line with the CP4 delivery plan, the entire project is scheduled for completion by March 2014. However, Kelly says improvements will be visible sooner, with NR “focusing on developing a phased commissioning plan to allow benefits to be taken from December 2013”. So what specific improvements are promised? As part of NR’s plans to alleviate conflicts and increase capacity, two extended Platforms 4 and 5 are planned. Each will be able to handle new 12-carriage trains that will eventually be used as part of the Thameslink programme, as well as new Intercity Express Project (IEP) stock that in time will replace the current Class 91/Mk 4 and HSTs that serve the station. A new Platform 3 will also be provided on the Up fast line, again with the ability to take IEP on high-speed London-bound trains and Thameslink trains. The existing Platform 2 will be extended at the south end, cutting across the current pointwork to access the existing Platform 1 that will (in turn) no longer exist. Platform 3 is effectively a brand new platform - built adjacent to the current Platform 3 where there was once a platform previously. According to NR this will include four waiting shelters and domestic services for a retail unit (a coffee or snack bar similar to those on existing platforms). At present, Platform 3 has somewhat rudimentary facilities dating back to Peterborough’s last major rebuild in the 1970s, while a Freightliner mess room sits towards the London end of the platform. It is not known if this will be retained. Two new platforms on the west side of the tracks - Platforms 6 and 7 - will be designed for local and regional east-to-west train services, freeing Platforms 2-5 for the busier and more frequent north to south main line trains. All of the extended and new platforms will be able to accommodate 12 carriages, linked by a new lift-accessible footbridge, extended westwards from the current structure. As with Platforms 2 and 3, these new platforms will feature a waiting room, public toilets (including facilities for disabled users), and similar provision for a shop. In addition, a new goods loop to the west of the station will aid freight capacity on the key cross-country route from the port of Felixstowe to the Midlands (RAIL 702). The exact pattern of trains that will run as part of the Thameslink Programme has yet to be finally determined. However, it will mean that as well as having the ability to use existing high-speed services to King’s Cross, city passengers will be able to travel directly to destinations south of London, via St Pancras, Farringdon and Blackfriars stations. “This vital development will allow a brand new fleet of longer 12-carriage trains to run from Peterborough to and through central London without the need to interchange with the Tube,” says David Statham, First Capital Connect projects director. Whatever is decided, NR’s plans for Peterborough are likely to take account of whatever demands are placed upon it by any new timetable patterns. Already, the improvements are visible to passengers - Phase 1 has been completed, with much of this work about making the best use of space currently available and brightening up the entrance to the station. The large-scale building work yet to come. And for this thriving and increasingly important rail junction, it can’t come a moment too soon.